About 930 described species. Most species live in moist terrestrial or freshwater environments, about 150 species are marine. Baccetti, B. 1987. The evolution of the sperm cell in the phylum Tardigrada (Electron microscopy of Tardigrades 5). Pages 187–191 in Biology of Tardigrades: Proceedings of the 4th International Symposium on the Tardigrada, Modena, September 3-5, 1985. (R. Bertolani, ed.) Mucchi, Modena. Bello, G. and S. Grimaldi de Zio. 1998. Phylogeny of the genera of the Stygarctidae and related families (Tardigrada: Heterotardigrada). Zoologischer Anzeiger 237:171?183. Bertolani, R., ed. 1987. Biology of Tardigrades. Selected Symposia and Monographs. U.Z.I. vol. 1, Mucchi, Modena, Italy. Bertolani, R. 1990. 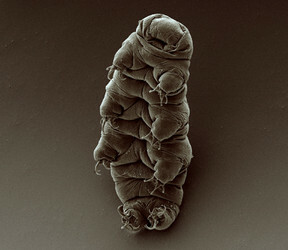 Tardigrada. Pages 49-60 in Reproductive Biology of Invertebrates, IV, B. (K. G. Adiyodi and R. G. Adiyodi, eds.) John Wiley, Chichester. Bertolani, R. and D. Grimaldi. 2000. A new eutardigrade (Tardigrada: Milnesiidae) in amber from the Upper Cretaceous (Turonian) of New Jersey. Pages 103-110 in: Studies on Fossils in Amber with Particular Reference to the Cretaceous of New Jersey. D. Grimaldi (eds.) Backhuys Publishers, Leiden, Netherlands. Bertolani, R., L. Rebecchi, and S. K. Claxton. 1996. Phylogenetic significance of egg shell variation in tardigrades. Zoological Journal of the Linnean Society 116:139-148. Budd, G. E. 2001. Tardigrades as 'stem-group arthropods': the evidence from the Cambrian fauna. Zoologischer Anzeiger 240:265-279.
Cooper, K. W. 1964. The first fossil Tardigrade: Beorn leggi Cooper, from Cretaceous amber. Psyche 71:41?48. Dewel, R. A., W. C. Dewel, and B. G. Roush. 1993. Tardigrada. Pages 143-183 in Microscopic Anatomy of Invertebrates Vol. 12 Onychophora, Chilopoda and Lesser Protostomata. (F. W. Harrison and M. E. Rice, eds.) Wiley-Liss, New York. Dezio, S. G., M. D. Gallo, and M. R. M. Delucia. 1987. Adaptive radiation and phylogenesis in marine Tardigrada and the establishment of Neostygarctidae, a new family of Heterotardigrada. Bollettino di Zoologia 54:27-33. Eibye-Jacobsen, J. 1996. On the nature of pharyngeal muscle cells in the tardigrada. Zoological Journal of the Linnean Society 116:123-138. Eibye-Jacobsen, J. 1997. New observations on the embryology of the Tardigrada. Zoologischer Anzeiger 235:201-216. Eibye-Jacobsen, J. 2001. Are the supportive structures of the tardigrade pharynx homologous throughout the entire group? Journal of Zoological Systematics and Evolutionay Research 39:1?11. Garagna, S., L. Rebecchi, and A. Guidi. 1996. Genome size variation in Tardigrada. Zoological Journal of the Linnean Society 116:115–121. Garey, J. R., D. R. Nelson, L. Y. Mackey, and J. Li. 1999. Tardigrade phylogeny: Congruency of morphological and molecular evidence. Zoologischer Anzeiger 238:205-210. Guidi, A. and L. Rebecchi. 1996. Spermatozoan morphology as a character for tardigrade systematics: Comparison with sclerified parts of animals and eggs in eutardigrades. Zoological Journal of the Linnean Society 116:101-113. Guidetti, R. and R. Bertolani. 2001. Phylogenetic relationships in the Macrobiotidae (Tardigrada: Eutardigrada: Parachela). Zoologischer Anzeiger 260:371?376. Guidetti, R., R. Bertolani, and L. Rebecchi. 2000. Cuticle structure and systematics of Macrobiotidae (Tardigrada: Eutardigrada). Acta Zoologica 81:27?36. Jørgensen, A. 2000. Cladistic analysis of the Echiniscidae Thulin, 1928 (Tardigrada: Heterotardigrada: Echiniscoidea). Steenstrupia 25:11?23. Jørgensen, A. and R. M. Kristensen. 2004. Molecular phylogeny of Tardigrada?investigation of the monophyly of Heterotardigrada. Molecular Phylogenetics and Evolution 32(2):666-670. Kinchin, I. M. 1994. The Biology of Tardigrades. Portland Press, London, Chapel Hill, NC, U.S.A.
Kristensen, R. M. and B. Neuhaus. 1999. The ultrastructure of the tardigrade cuticle with special attention to marine species. Zoologischer Anzeiger 238:261-281. McInnes, S. J. and P. J. A. Pugh. 1998. Biogeography of limno-terrestrial Tardigrada, with particular reference to the Antarctic fauna. Journal of Biogeography 25:31-36. Nelson, D. R. 1991. Tardigrada. Pages 501-521 in Ecology and Classification of North American Freshwater Invertebrates. (J. H. Thorp and A. P. Covich, eds.) Academic Press, London. Nelson, D. R. and R. P. Higgins. 1990. Tardigrada. Pages 393–419 in Soil Biology Guide. (D. Dindal, ed.) Wiley, New York. Pilato, G. 1982. The systematics of Eutardigrada - a comment. Zeitschrift für Zoologische Systematik und Evolutionsforschung 20: 271-284. Pollock, L.W. 1995. New marine tardigrades from Hawaiian beach sand and the phylogeny of the family Halechiniscidae. Invertebrate Biology 114:220?235. Pugh, P. J. A. and S. J. McInnes. 1998. The origin of Arctic terrestrial and freshwater tardigrades. Polar Biology 19:177-182. Wright, J. C., P. Westh, and H. Ramlov. 1992. Cryptobiosis in Tardigrada. Biological Reviews of the Cambridge Philosophical Society 67:1–29. Waterbears (Tardigrades). Swedish Museum of Natural History. Biosystematics of the Marine Heterotardigrades. Research project by J. Garey, F. Romano, and W. Miller. The Edinburgh Tardigrade project. Mark Blaxter Lab. Phylum: Tardigrada. IIziko Museums of Cape Town.